Here is a great layout from design team member Tisha Marzewski. She has used the Girl Friday papers from Cosmo Cricket. Hope to bring you more layouts using the new product Denise is getting in the store. Tisha is working hard! Let us know what you think and leave Tisha some scrappy love!! Thanks, Tisha! Great job girl!! Keep 'em coming!! Tonight is the night and this will be the final reminder: email me at luvtoscrap1972@yahoo.com and let me know your favorite scrappin' product to be entered in the drawing for $25 in product from Denise. I will be picking a winner tonight and announcing the winner tomorrow afternoon! Be watching to see if you are our first blog winner! Our next contest will start tomorrow. THE DEADLINE FOR THIS CONTEST WILL BE SEPTEMBER 15. This contest is open to anyone in the United States and if you aren't able to go in to the store locally Denise will mail you the prize! How great is that??!! To win this contest you have to email DENISE at usoffice@scwnet.com the answer to THIS QUESTION: I would like to make a slide show and feature something of YOURS!! What is it that I want to feature?? You need to read carefully through all the previous posts to find this answer. If you answer CORRECTLY your name will be entered for a drawing for a prize... I will let you know more about that later... stay tuned!!! Don't forget to check tomorrow to find out who the winner is for the August contest!! Have a good night everybody and Happy Scrappin' from The Attic!! Hello! It is a rainy Sunday morning here in Cave City. It has watered my flowers so now I can stay inside and share some things with you! The Glimmer Mist takes you to a whole new level of creativity!! You shake it and spray... everything! You can use it with their masks and make your own wonderful sparkly background papers. Spray the masks and stamp with them and they even have acrylic stamps to match! Oh, the joys of Tattered Angels!! 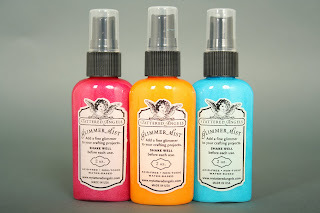 The last video today is from Wendy Senger the owner and creator of Glimmer Mist. She brings us great techniques that shows us exactly how to use the Glimmer Mist (and what to do when the paper curls...personally, I like the effect! I think it gives the paper character!!) Enjoy!! Oh, you can find me at MY BLOG HAPPILY SCRAPPIN' TODAY to see more of my work and find out more about me. Have a great day everybody and Happy Scrappin' from The Attic!! Ok, I said I'd pick a winner yesterday morning. Well, I'm going to extend the contest deadline to Monday night AUGUST 31, at 10:00 pm. I will also accept YOUR EMAILS and comments too. I realized after getting only 5 comments that maybe some of you gals might not know how to leave comments. I talked to a couple of ladies today that were having real issues getting the comment thing to work. I thought you could just click on the word comment and leave one. But I discovered you have to create an account (this is free, but it will cost you some of your time) which could create another problem. So, to solve the problem and be fair to ALL of you just click on EMAIL LISA at the top left corner. Send me an email and tell me what your favorite scrappin' product is. Also tell me what you would like to see here on the blog and I'll try to add in the suggestions in future posts. I'll save each email and choose one winner on Monday night. Don't worry! If you've already posted a comment I WILL include those too! I won't miss anyone!! 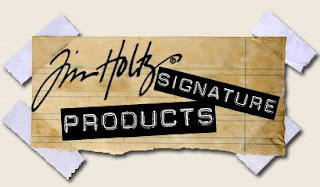 I'll leave you with another video from our "grungy guru" Tim Holtz. This is his brand new, just released at CHA Summer, ROCK CANDY. No, you don't eat it... it is Rock Candy Stickles and Rock Candy Distress Crackle paint. This will definitely make you want to go create something!! I hope to have an inbox full of messages from all of you. Have a great night all and Happy Scrappin' from The Attic! Hey ya'll!! Hope everyone is doing great out there!! Keep watching for the winner of the $25 scrappy prize from Denise. I know, I had said this morning, but it will be a little later. Stay tuned!! In the mean time, I'd like to share a list of some newcomers to the Attic this year. They are all great and I know you are just going to love them all!! Here are your new names to The Attic-Click each name and you will be taken to their website or blog. Just hit the BACK button to come back here to us. 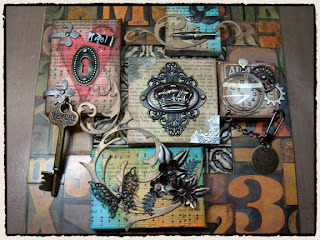 You can find him on his blog at www.timholtz.typepad.com whipping up all sorts of BRILLIANT creations!! Let me start by telling you Tim is a traveler! 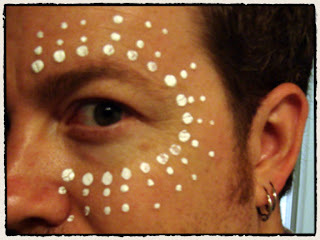 You can go check out THIS blog entry and read all about one of his many travels. He is a grungy guru! Most all of his stuff is for distressing, making vintage looking projects, and even the tools are made to distress! He has a hammer for distressing metals, eyelets, and even brads! It works! I have this little gem and it is too cool!! This one of his artistic creations... made from lots of goodies from his Idea-Ology line. The Distress Ink is among one of my favorite things he has! As you can see from the picture below there are so many colors to choose from! 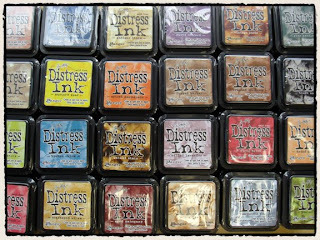 He also has ink refills for each pad, Distress Stickles, and Distress Crackle paints in each of the colors as the inks. So they all match and blend so good. You can blend the inks with water or spritz them with water and get all kinds of great effects. Here are a couple of videos for you. This one shows you some of the great things to do with his Distress Inks. (He uses water with his inks... I've used regular old rubbing alcohol *clear stuff* and it is wonderful! It has a raised/embossed effect! You should try it with both the water and the alcohol and see which you like better). Here is Tim at CHA showing off his Idea-ology line. You can see all the good stuff he does with this line! You can go to you tube (CLICK HERE) and see all of his videos in one place. Be sure to check back often and see what else I'll have for you! There are so many great ideas floating around on the Internet! I never really knew what was out there until I found BLOGGING! Then I created my own... it is really easy and a way to put your pages/projects out to be seen. If you want to start a blog and just don't have any idea of how to get started, email me at luvtoscap1972@yahoo.com and I'll be happy to help you get started! Have a great day everybody! Happy Scrappin' from The Attic!! WANT TO WIN SOME SCRAPPIN' GOODIES?? This is it! Our first giveaway!! Leave a comment on this post and I will pick a winner on Thursday morning. Tell us what your favorite scrapbook product is and if you have a blog leave us a link (although you do not have to have a blog or website to win). You could be the winner of $25 in FREE MERCHANDISE hand picked from Denise at The Scrapbook Attic!! You have until Sept. 30 to pick up your goodies. If you haven't registered for the 9th Annual Scrapbook Extravaganza yet you need to do so!! You don't want to miss this event!! Have a great day and Happy Scrappin' from the Attic! You will notice some new additions here..... one of the cutest additions is little Baby Gage! Isn't he just the cutest little guy?? On the right sidebar you will find some great links.... go check out the websites and look their blogs over. You will find a lot of great ideas and fantastic product lines there! I get inspiration everyday from some of those and I'm sure you will be inspired to create after you leave. I will put them all in a slide show for everyone to see and get inspiration for their own rooms. There is no time limit for this... just keep on sendin' them in and I'll keep on posting!! Have a good night and Happy Scrappin' to all from The Attic!! Welcome to The Scrapbook Attic and More!! I'm Lisa and I am BLOGGIN' FOR THE ATTIC!! I'm so excited to be bringing you the latest news and information from one of the best scrapbook stores in Arkansas! Stick around and see what we have up our sleeve for you! 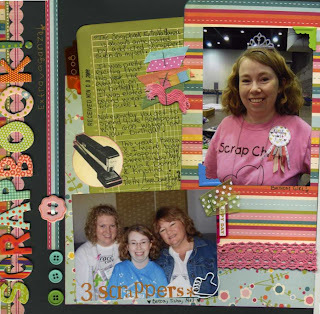 We are just 3 months away from our annual Scrapbook Extravaganza and you don't want to miss it! Go HERE to sign up or get more information. I will be posting links on the sidebars for the companies that will be at the event. Make sure you keep watching for those and go visit them to see what all they have in their galleries and view their latest product lines. This blog will keep you up to date on the newest items coming in from Summer CHA as well as events, contests and more from the store. Don't forget... leave us a comment and tell us where you're from and how you heard about us. If you have anything you would like to see posted here, let me know.